From Blenheim palace to A-list celebrity parties for Elle Macpherson, Australia's favourite swing singer is taking the UK by storm! Featured at the Rugby World Cup Final in Sydney and winner of "Best New Swing Entertainer", Dominic has been winning over audiences from Sydney to San Juan with his swingin' interpretations of hits from Bobby Darin, Frank Sinatra and Dean Martin. 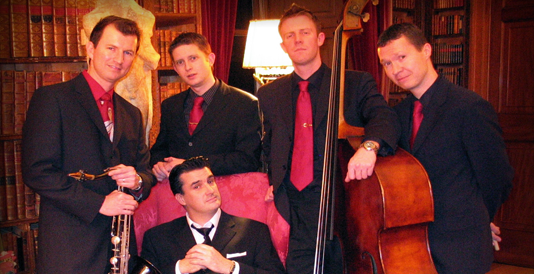 Dominic's jumpin' 5 piece will have your fingers snappin' to the nostalgic sounds of Louis Prima, Dean Martin, Bobby Darin and others. With double bass, piano, drums, saxophone and guitar and lookin' as sharp as Dad's razor, this band is a proven winner for your event.